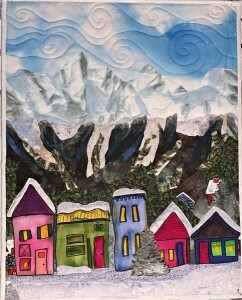 Elvis Visits Summit County is a fun quilt with surprises in the windows – just a fun quilt to make, the size is 37″ by 42″. 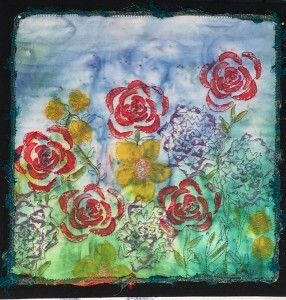 Raw edge applique, mostly commercial fabrics. 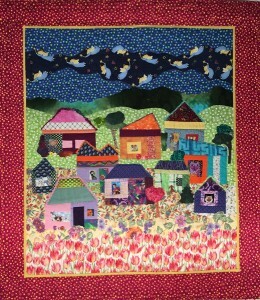 Kitchen Garden is a small, 12 by 12 inch quilt made by stamping vegetables on hand painted cloth. The red roses are from the end of a stalk of celery, the purple was lettuce and the yellow radishes. Who knows what I will come up with next!